Negros Oriental has launched recently its destination brand, “Negros Oriental: This is what you want to live,” to step up its tourism marketing to attract more local and international tourists. 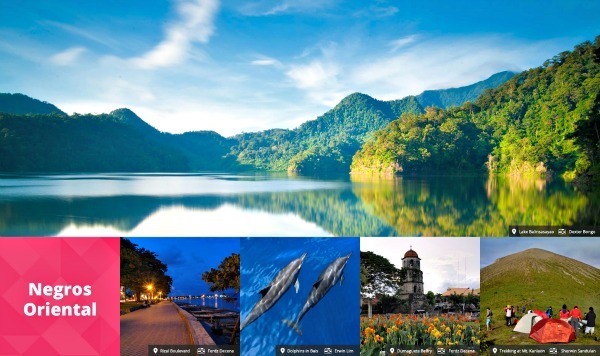 The eco-tourism capital of Negros Island, where culture meets adventure, represents the tourism circuit of five local government units, namely: Dumaguete City as the gateway of Negros Oriental; Dauin as dive capital; Tanjay City as seat of culture and tradition; Bais City, dolphin watching; and Manjuyod town, known for its wide stretch of sand bar. With its natural chain of rugged green mountains and a wide range of coastal beaches or ridge-to-reef attractions in the identified tourism areas, the brand logo is visually interpreted as a stylized leaf that represents province’ environmental conservation and organic agriculture. Under the Local Governance Support Program for Local Economic Development (LGSP-LED), the private and public sectors also formulated a tour package with common rates for travel and tours operators in the province. The two separate travel and tour operator groups in the province successfully agreed to have common tour packages and create more opportunities in the local tourism industry. In an industry forum, Palawan Tourism Council president Debbie Tan shared Palawan's best practices in tourism promotion as "World's Best Island Tourism" including tour packaging. Tan cited the importance of working together and complement each business player in the industry to boost tourism development. The circuit of tourism sites that make up the itineraries of these packages must focus on specific tour sites, said Tan. “With this, the LGUs are ensured of sustainable tourism activities that benefit the communities especially the locales,” Tan added. For her part, Andrea Trinidad-Echavez of USAID COMPETE presents how Bohol managed to scale up its tourism image after the 7.2 magnitude earthquake. LGSP-LED is funded by the Canadian International Development Agency (CIDA) and implemented in partnership with the Department of the Interior and Local Government (DILG).